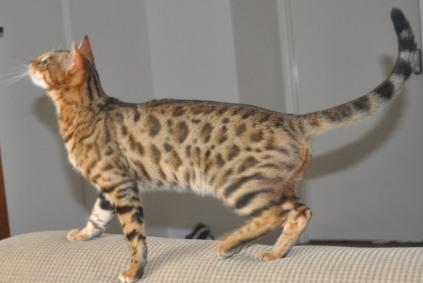 The goal of the Bengal breeding program is to create a domestic cat which has the physical features distinctive to the small forest-dwelling wild cats, but with the loving dependable temperament of the domestic cat. Keeping this goal in mind, judges shall give special merit to those characteristics in the appearance of the Bengal which are distinct from those found in other domestic cat breeds. 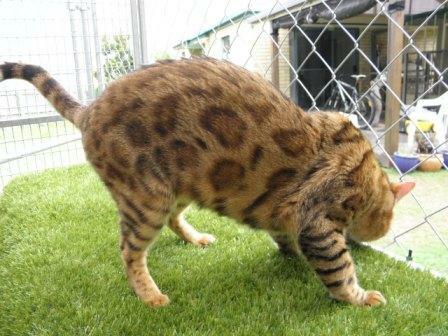 The conformation gives the Bengal cat a basic "feral" appearance. It is medium to large, sleek, and very muscular with hind-quarters slightly higher than shoulders. The head is a broad modified wedge with rounded contours, longer than it is wide, with a large nose and prominent whisker pads. The ears are medium set, medium small, short with a wide base and rounded tips. Shape - Broad, modified wedge with rounded contours. Longer than it is wide. Allowance to be made for jowls in adult males. Size - Slightly small in proportion to body, but not to be taken to extreme. Profile - Gently curving forehead to bridge. Bridge of nose extends above the eyes. Nose has a very slight concave curve. Nose - Large and wide; slightly puffed nose leather. Muzzle - Full and broad, with large, prominent whisker pads and high, pronounced cheekbones. Size - Medium small, basically short ears, with wide base and rounded tips. Placement - Set as much on side as top of head, following the contour of the face in the frontal view, and pointing forward in the profile view. Furnishings - Light horizontal furnishings acceptable, but lynx tipping undesirable. Shape - Oval, may be slightly almond shaped. Size - Large, but not bugged. Placement - Set wide apart, back into face, and on slight bias toward base of ear. Colour - Both eyes to be the same colour. 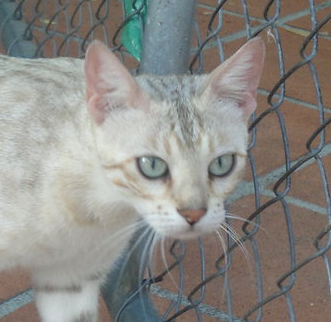 Brown Tabby (spotted or marbled): Any colour except blue or aqua. Seal Sepia Tabby: gold, to green. Seal Mink Tabby: blue-green (aqua). Size - Thick and muscular, large in proportion to head. Length - Long, and in proportion to body. Shape - Long and substantial, but not oriental or foreign. Size - Medium to large (but not quite as large as the largest domestic breed). Boning - Robust, never delicate. Musculature - Very muscular, especially in the males, one of the most distinguishing features. Length - Medium, slightly longer in the back than in the front. Boning - Large and substantial. Never delicate. Musculature - Very muscular, like the body. Shape - Thick, tapered at end with rounded tip. Size - Medium large. Length: Medium. Length - Short to medium. Allowance for slightly longer coat in kittens. Texture - Thick, luxurious, and unusually soft to the touch. 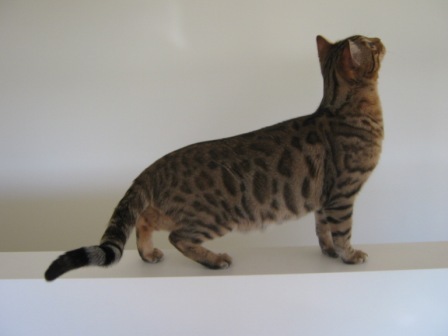 Spots on body running together vertically forming a mackerel tabby pattern, circular bulls-eye pattern on marbleds, substantially darker point colour (as compared to colour of body markings) on Lynx Points, Seal Sepia or Seal Mink. Do not penalise for mousey undercoat. Belly not spotted. Paw pads not consistent with their colour group description, or paw pads not all the same colour. Any distinct locket on the neck, chest, abdomen or any other area not provided for in the standard. Spots shall be random or aligned horizontally. Rosettes formed by a part- circle of spots around a distinctly redder centre are preferable to single spotting, but not required. Contrast with ground colour must be extreme, giving distinct pattern and sharp edges. Strong, bold chin strap and mascara markings desirable. Blotchy horizontal shoulder streaks desirable. Belly must be spotted. 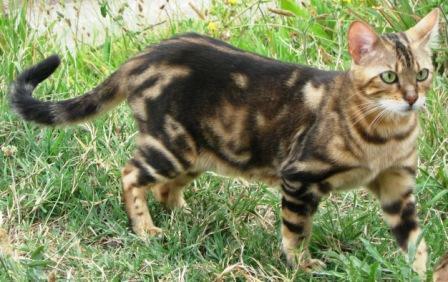 Markings, while derived from the classic tabby gene, shall be uniquely different with as little "bulls-eye" similarity as possible. Pattern shall, instead, be random giving the impression of marble, preferably with a horizontal flow when the cat is stretched. Vertical striped mackerel influence is also undesirable. 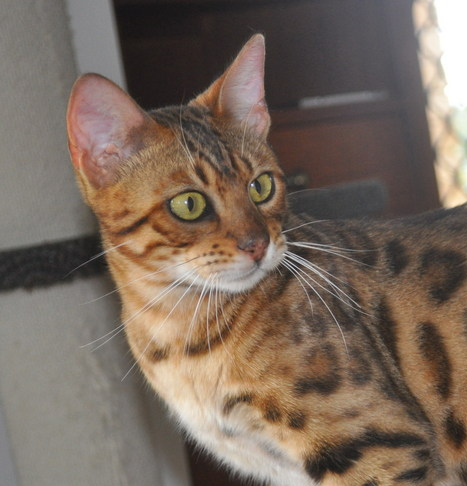 Preference should be given to cats with three or more shades; i.e., ground colour, markings, and dark outlining of those markings. Contrast must be extreme, with distinct shapes and sharp edges. Belly must be spotted. Seal Sepia Marbled Tabby only. 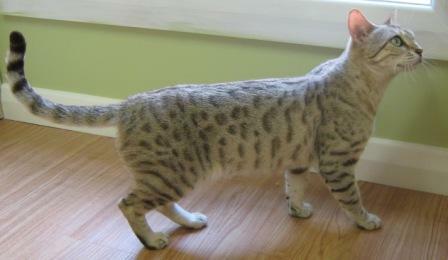 Seal Mink Marbled Tabby only. All variations are allowed; however a high degree of rufinism yielding a yellow, buff, tan, golden, or orange ground colour is preferred. 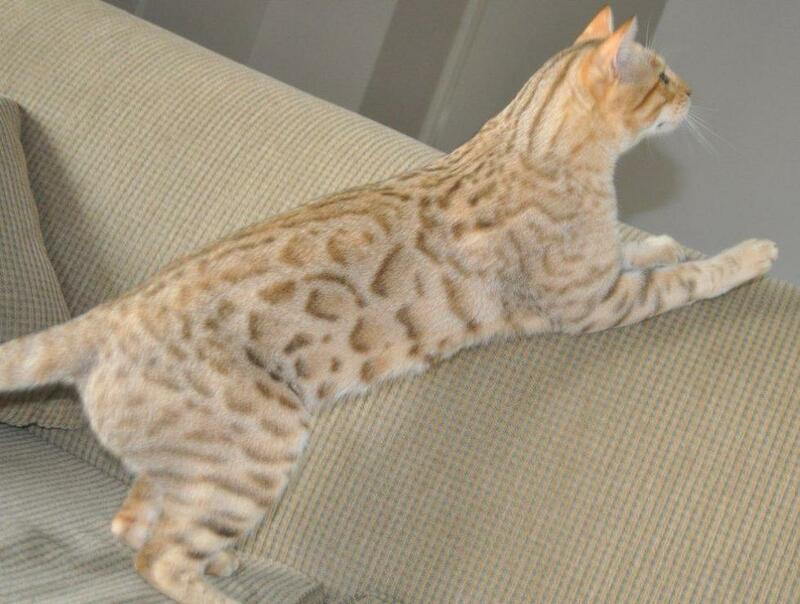 Markings may be virtually black, brown, tan, or various shades of chocolate or cinnamon. Light spectacles encircling the eyes, and a virtually white ground colour on the whisker pads, chin, chest, belly, and inner legs (in contrast to the ground colour of the flanks and back) is desirable. Rims of eyes, lips, and nose should be outlined with black, and centre of nose should be brick red. Paw pads and tail tip must be black. Ground colour should be ivory to cream. Pattern can vary in colour from dark seal brown, light brown, tan, or buff, with the light spectacles, whisker pads, and chin. There should be little difference between colour of body markings and point colour. Paw pads seal brown. Tail tip must be dark seal brown. Eye colour: blue. Ground colour should be ivory, cream, or light tan with pattern clearly visible. Pattern may be various shades of sable brown to bitter chocolate. Ivory cream spectacles encircling the eyes, and ivory cream whisker pads and chin are desirable. There should be very little or no difference between the colour of the body markings and the point colour. Paw pads should be dark brown with rosy undertones allowed. Tail tip should be bitter chocolate (dark seal sepia/mink). Aridlands Kanya - Sheeted marble pattern. Kinglake Iago - Sepia Rosetted, open rosettes. Long muscular body, thick neck. Kinglake Nala - horizontal markings - no bullseye, no rib-bars.